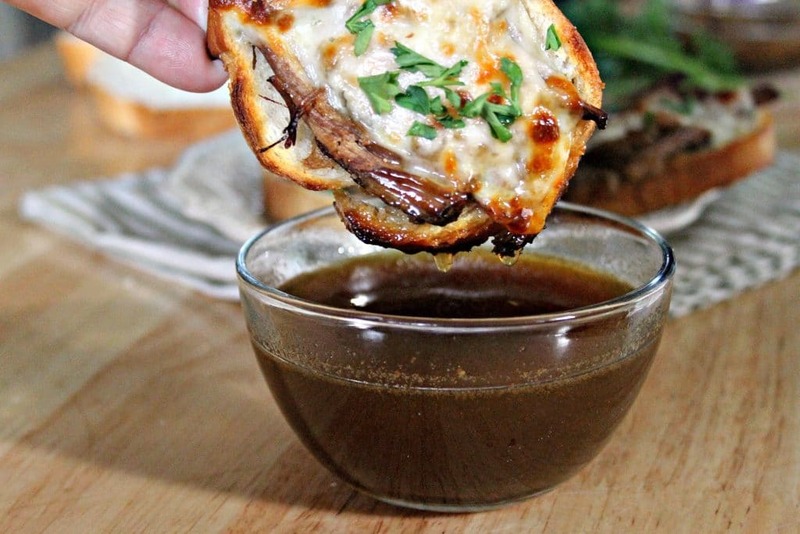 Are you craving a delicious French Dip sandwich? If you can’t wait to bite into a French Dip sandwich, you are going to love the best Instant Pot French Dip Sandwich recipe. It is easy to make and makes a great dinner idea. If you have never had a french sandwich, you don’t know what you are missing. When you use this Instant Pot French Dip Sandwich Recipe you can have french dip sandwiches as often as the craving hits you. What is a French dip? A French dip is a sandwich that is served warm. 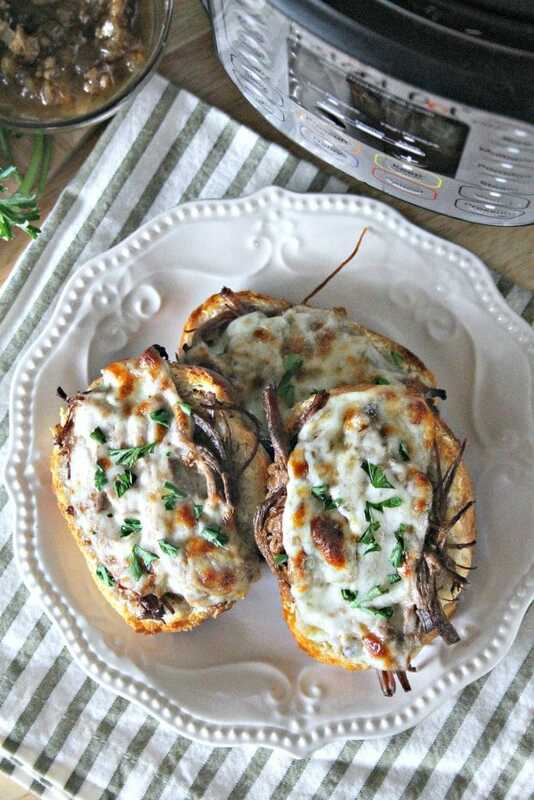 It is filled with roast beef and cheese that is layered on french bread that has been toasted. French dip is usually served with a side of the beef au jus, which is the beef juice. 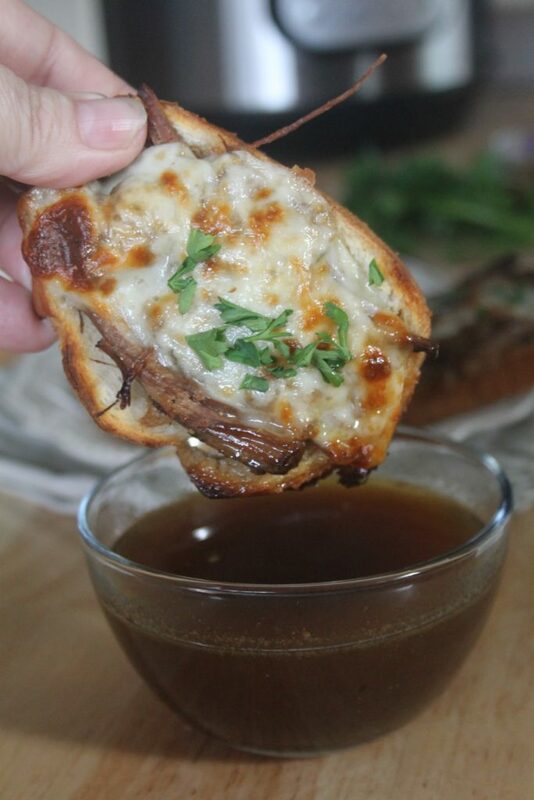 The au jus is used for dipping the sandwich in. 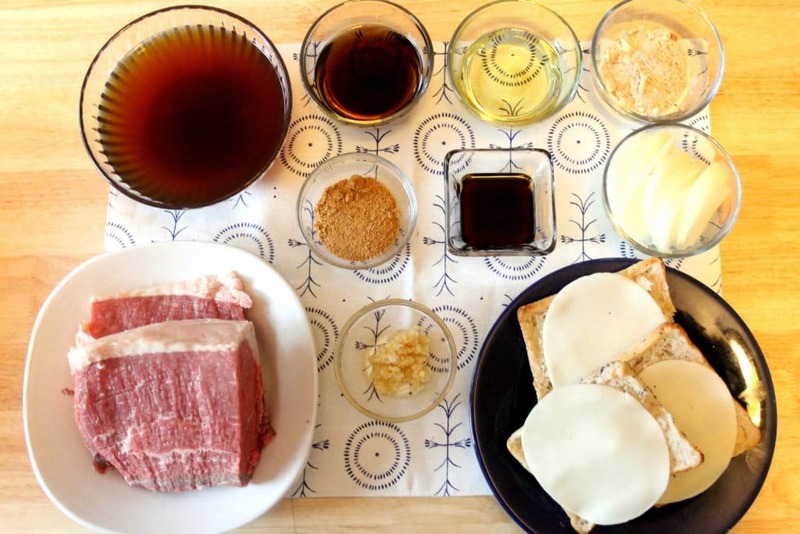 A french dip sandwich has a great blend of roast beef, melted cheese, toasted bread and au jus. What kind of bread do you use for French dip? While you can use any type of roll or hearty bread for a french dip sandwich, it is usually french bread. Some people choose to toast the bread first. However, when you melt the cheese in the oven, this will also toast the bread. What is the best meat to make French dip? A French Dip sandwich is a hot roast beef and cheese sandwich that is dipped into au jus. The beef roast used for Instant Pot French Dip sandwich is moist and tender. If you don’t have french bread any type of hearty roll will work. Steps 1-3: On one side, brush your roast with olive oil and sprinkle the seasoning salt. Press salt into the meat. Repeat on the other side. Steps 4-7: Set your Instant Pot to sauté. Add 2 tablespoons of olive oil to your instant pot. Add the roast and brown on both sides. Set beef aside. 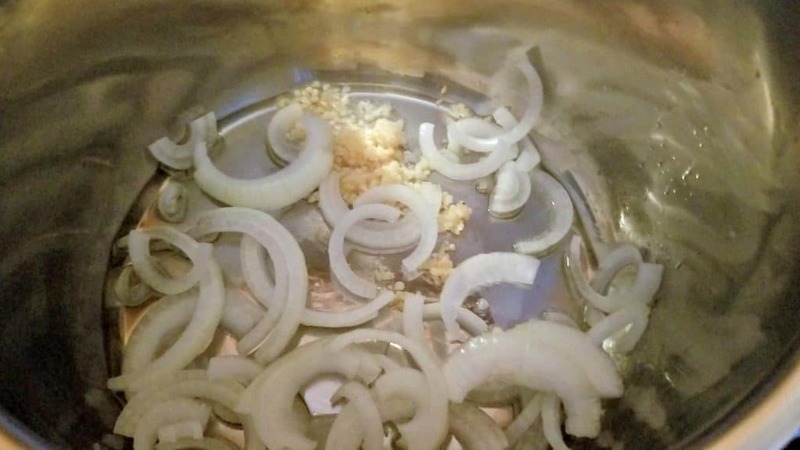 Steps 8-10: Add the olive oil, garlic, and onion and cook for 2 minutes. Stir occasionally. 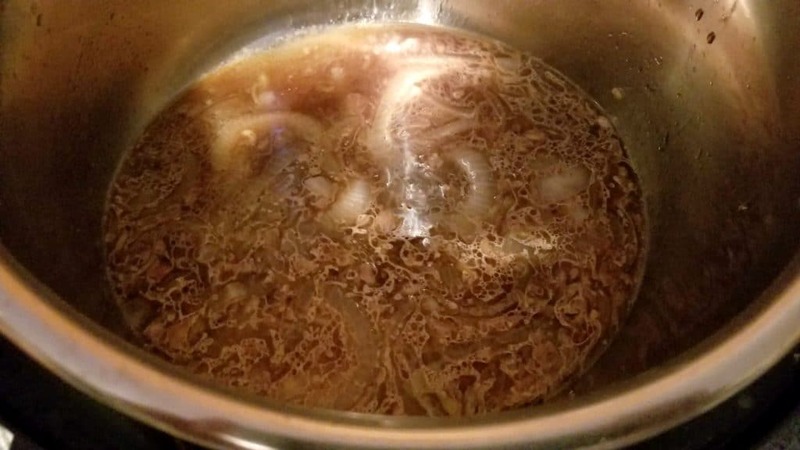 Steps 11-16: Add beef broth, soy sauce, Worcestershire, sauce, and dry soup to the Instant Pot. Mix well. Add the roast. Step 17: Put lid on Instant Pot and set to high pressure for 1 hour. Make sure the vent is closed. When the time is up, allow the pressure to release naturally for 15 minutes. Open steam vent and wait for steam to completely stop before opening lid. 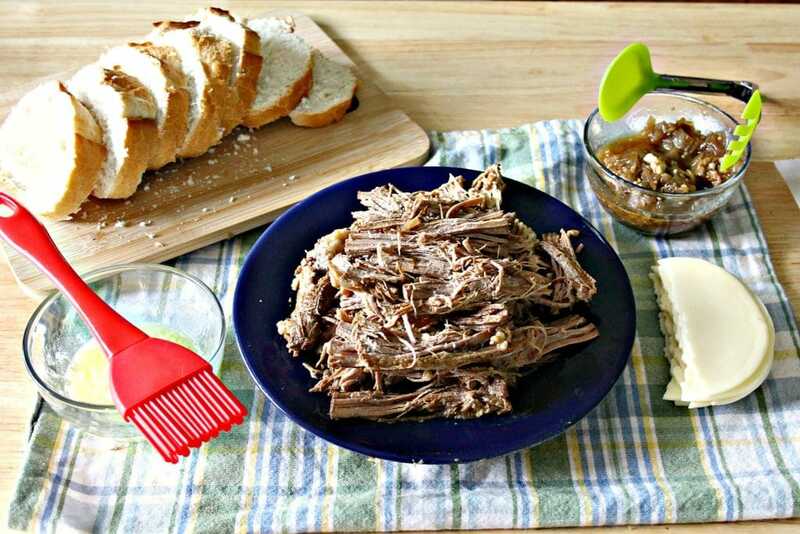 Steps 18-20: Shred the beef and place on a plate. Strain the liquid from the Instant Pot and add to a small bowl. This will be your au jus sauce. Steps 19-24: Turn broiler on the oven. Make an assembly line to put your sandwiches together. I melt butter and brush on the bread, but this is optional. Line the bread up on a baking sheet and add meat, onions, and top with the cheese. Place under broiler until cheese begins to bubble and brown. Add fresh parsley if desired and serve immediately. 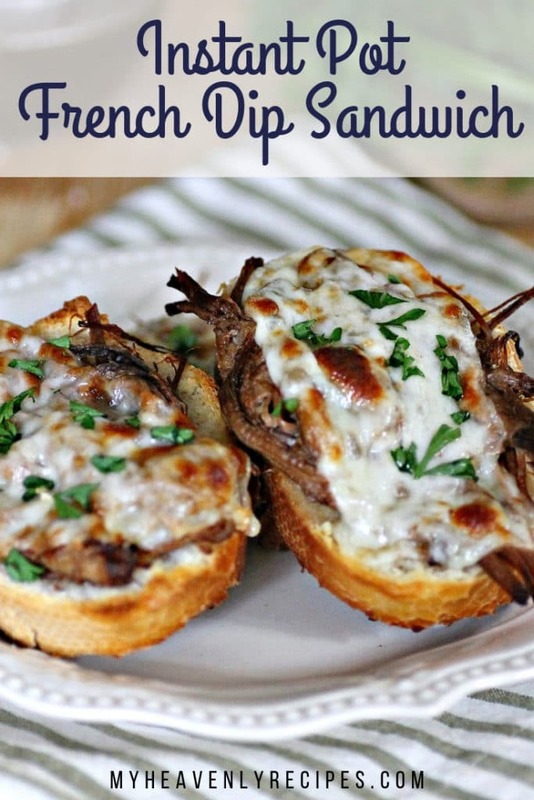 Are you craving a delicious French Dip sandwich? 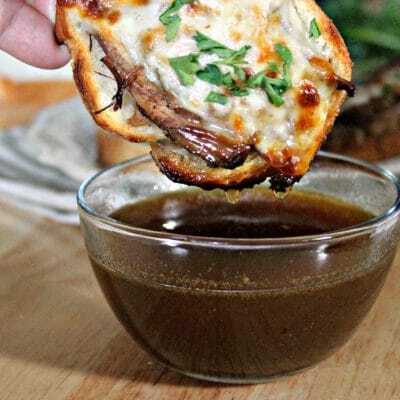 If you can't wait to bite into a French Dip sandwich, you are going to love the best Instant Pot French Dip Sandwich recipe. It is easy to make and makes a great dinner idea. 2-3 tablespoons of Morton’s Season All Salt or another seasoning like Mrs. Dash, etc. On one side, brush your roast with olive oil and sprinkle the seasoning salt. Press salt into the meat. Repeat on the other side. Set your Instant Pot to sauté. Add 2 tablespoons of olive oil to your instant pot. Add the roast and brown on both sides. Set beef aside. Add the olive oil, garlic and onion and cook for 2 minutes. Stir occasionally. Add beef broth, soy sauce, Worcestershire sauce and dry soup to the Instant Pot. Mix well. Add the roast. Put lid on Instant Pot and set to high pressure for 1 hour. Make sure the vent is closed. When the time is up, allow the pressure to release naturally for 15 minutes. Open steam vent and wait for steam to completely stop before opening lid. Shred the beef and place on a plate. Strain the liquid from the Instant Pot and add to a small bowl. This will be your au jus sauce. Turn on broiler on the oven. Make an assembly line to put your sandwiches together. I melt butter and brush on the bread, but this is optional. Line the bread up on a baking sheet and add meat, onions, and top with the cheese. Place under broiler until cheese begins to bubble and brown. Add fresh parsley if desired and serve immediately.